First let’s talk about how to get a wine glass to “sing.” First, get a wine glass (kids, make sure to get your parents’ permission first before attempting this experiment; husbands – get your wives’ permission). While crystal makes excellent sounds, it is more fragile than glass and more expensive. So, since glass will work fine, I’d recommend using glass over crystal. 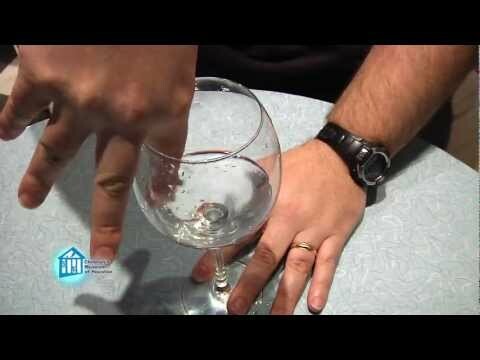 Once you have a glass, fill it about halfway with water, wet your finger and rub it around the edge. It takes a little exploration with how much pressure to use, but you should eventually get a great tone coming from it. It occurs because your finger makes the glass vibrate by constantly pulling a little, slipping, then pulling again. Now that you can make a glass sing, change the amount of water in the glass – maybe pour some out or add in some more. What happens to the sound? Remember that the frequency, or tone, depends on how fast waves are passing a given point. Because sound travels at a specific speed, the frequency is affected by the wavelength, or the length of the waves you are creating. By changing the amount of liquid, you change the wavelength and therefore hear different tones. Next step is to create a wineglass harmonica – a whole bunch of glasses filled to different levels to create different notes so that you can play songs. If you make one, please send us a recording!